From the breakdown of the Bretton-Woods Agreements to the recent charges of “currency war”1 against countries using unconventional monetary policies based on quantitative easing, the instability and volatility of exchange rates have been recurring issues, both in policy and business circles. Governments tried a variety of strategies to handle the problem, from multilateral arrangements such as the Louvre and Plaza agreements in the 1980s to fixed pegs, the Eurozone appearing as an extreme case of the latter. Why so much trouble? Because of the widely accepted idea that exchange rate volatility generates additional costs and uncertainty detrimental to economic activity, especially international trade. For the latter, the idea runs from Ethier (1973) to recent firm-level evidence (Cheung and Sengupta 2013, Héricourt and Poncet 2015). This is also in line with business surveys. According to the 19th Annual Global CEO Survey by PWC, 73% of CEOs are concerned to some extent by exchange rate volatility. Surprisingly, macroeconomic evidence on the impact of exchange rate volatility on trade yielded either small or insignificant effect on aggregate outcomes. Common explanations for this missing evidence refer to the existence of hedging instruments for exchange rate risk. Recent works on countries with higher financial constraints (and consequently, less hedging opportunities) support this argument, whether at the macro level (Grier and Smallwood 2007) or the micro level (Héricourt and Poncet 2015). In this column, we argue that on top of this, big, multi-destination firms – which account for the bulk of aggregate exports – reallocate exports across countries. By transferring trade to less volatile destinations, they leave exports mainly unchanged at the macro level. Several mechanisms can generate a negative impact of exchange rate volatility on trade. Following Ethier (1973), one may think of exchange rate risk as creating an uncertainty for the exporter’s earnings in her own currency, which is similar to an increase in variable costs. Bernard et al. (2011) show that higher variable trade costs (e.g. an increase in exchange rate volatility) lead to a decrease in all trade margins. Exchange rate volatility may also increase the sunk costs of exports, which can be seen as a form of investment in intangible capital. How should firm performance impact this relationship between bilateral exchange volatility and exports? Multi-destination firms straightforwardly face a larger risk compared to firms serving less destinations, insofar as they are more exposed to changes in exchange rate in many countries. Each supplementary destination in the portfolio of markets served by the firm adds a new source of exchange rate fluctuations. Multi-destination firms are also potentially more able to handle exchange rate risks than smaller firms, because of a better access to hedging instruments (Martin and Méjean 2012, Ito et al. 2015). However, a higher number of destinations served also means increased diversification possibilities. Multi-destination firms have the ability to be more reactive to increased exchange rate volatility, by reallocating exports away from more volatile destinations. In other words, the elasticity of firm-destination exports to bilateral exchange rate volatility may be magnified by firm performance because of optimal reallocation across destinations. In a recent paper, we find support for this kind of mechanism using a panel of French firms (Héricourt and Nedoncelle 2016). Based on a yearly firm-level dataset containing country-specific trade data from the French Customs and balance-sheet information over the period 1995-2009, we identify the impact of exchange rate volatility on different measures of intensive and extensive margins. Exchange rate volatility is defined as the yearly standard deviation of monthly growth rates in the real exchange rate, the latter being the nominal exchange rate of the French currency with respect to the partner's currency, multiplied with the ratio of partner's price level over French price level. On average, we find that a 10% increase in bilateral volatility reduces the value exported by 0.25%, and entry to a given export market by 0.15%. However, these average estimates hide a large heterogeneity across firms. For a given exchange rate volatility, large firms tend to reduce exports towards the considered destination disproportionately more than small firms. Besides, the effects are mostly concentrated at the intensive margin. Ranking firm-country observations according to the number of destinations served, our results show that a 10% increase in bilateral volatility decreases the value exported at the top 10% by 3.6% relative to the bottom 10%. Similar computation for the differential effect between the top 1% and the bottom 1% gives a 6.2% decrease. For entry, the net differential impacts are equal to -0.4% (top 10%; bottom 10%) and -0.6% (top 1%; bottom 1%). Results are strongly robust to the inclusion of proxies for natural (through imports) and financial hedging. Even when one accounts for hedging strategies, the negative impact of bilateral volatility keeps increasing with the number of destinations served. 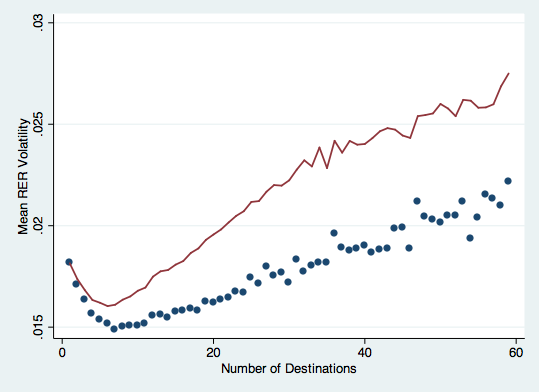 We argue that this pattern can be explained by the reallocation of firm’s exports across destinations. Figure 1 reports two types of exchange rate volatility faced by firms according to the number of destinations served. The full line represents the average of the firm-level arithmetic mean of exchange rate volatilities over all destinations. The dotted line represents the exports-weighted (by the share of each destination in all firm-year exports) average exchange rate volatility faced by firms. The higher the number of destinations, the higher the average exchange rate volatility. Yet, once firm choices are taken into account, we find that the average exchange rate volatility increases less than if no reallocation choices were made by the firm. Firms seem to choose their export destinations so as to get away, at least partly, from destinations with high volatility. This descriptive evidence of a reallocation behaviour is supported by our econometric analysis. We investigate how bilateral exports from a firm to a considered destination react to a measure of relative exchange rate volatility. The latter is the ratio of bilateral exchange rate volatility over a measure of multilateral exchange rate volatility, which is a weighted average of volatilities in other countries the firm could serve conditionally to her sector. We find that multi-destinations firms take into account what happens in all relevant destinations. When bilateral volatility increases relative to multilateral volatility, exports towards the considered market are hampered. We suggest a possible rationalisation of this behaviour through the lens of Markowitz portfolio theory. For a given level of profitability on each market, firms tend to reallocate exports away from destinations characterised by higher, relative exchange rate volatility, in order to hold the average risk level of their destinations portfolio constant. This behaviour is exacerbated when the number of destinations actually served increases, i.e. when the scope of possible reallocations is extended. More destination-diversified firms are therefore better able to handle exchange rate risks. We saw previously that the effect was especially strong for firms at the top 10% and top 1% of our sample. Over the period 1995-2009, these firms account for 91% and 63% of aggregate exports, respectively. Heterogeneity in the possibility to reallocate exports across countries is therefore crucial, since the dynamics of these big, multi-destination firms shape the way aggregate trade flows react to exchange volatility. This is also consistent with evidence on 32 countries recently provided by Freund and Pierola (2015) that very large firms shape country export patterns. We investigate these aggregate implications by studying how the reaction of sector-level bilateral exports to exchange rate volatility is impacted by the level of within-sector export concentration. We find that the trade-deterring effect of exchange rate volatility at the sectoral level is dampened more when exports are concentrated in a few big firms. For a sufficient level of concentration, exchange rate volatility does not impact exports at the sectoral level. Our results help to reconcile the negligible aggregate trade elasticity to exchange rate volatility and the bilateral, negative micro effect growing with the number of destinations served. Multi-destination firms are able to reallocate exports across destinations so as to minimise the overall impact of exchange rate volatility on their total exports. In that case, a large trade-deterring effect of exchange rate volatility in the firm-destination dimension is consistent with a small/zero trade elasticity to exchange rate volatility at the macro level, independently from hedging strategies. On the policy ground, our study implies that developed financial markets are not the only way to hedge against volatility. Big, multi-destination firms may use the diversification allowed by their portfolio of destinations as an additional shield. For emerging and developing countries, promoting the development of big exporters may therefore appear as a way to offset, at least partly, the adverse consequences of low level of financial development regarding exchange rate volatility. Bernard, A, S Redding and P Schott (2011), “Multiproduct Firms and Trade Liberalization”, The Quarterly Journal of Economics, 126(3), 1271–1318. Cheung, Y-W and R Sengupta (2013), “Impact of Exchange Rate Movements on Exports: An Analysis of Indian Non-Financial Sector Firms”, Journal of International Money and Finance, 39, 231–245. Ethier, W (1973), “International Trade and the Forward Exchange market”, American Economic Review, 63(3), 494–503. Freund, C and M Pierola (2015), “Exporter Superstars”, Review of Economics and Statistics 97 (5), 1023-1032. Grier, K B and A D Smallwood (2007), “Uncertainty and Export Performance: Evidence from 18 Countries,” Journal of Money, Credit and Banking, 39(4) 965-979. Héricourt, J and C Nedoncelle (2016), “How Multi-Destination Firms Shape the Effect of Exchange Rate Volatility on Trade: Micro Evidence and Aggregate Implications”, CEPII Working Paper 2016-05. Héricourt, J and S Poncet (2015), “Exchange Rate Volatility, Financial Constraints and Trade: Empirical Evidence from Chinese Firms”, World Bank Economic Review, 29(3), 550-578. Ito, T, S Koibuchi, K Sato and J Shimiou (2015), “Exchange Rate Exposure and Risk Management: The Case of Japanese Exporting Firms”, NBER Working Paper 21040. Martin, J and I Méjean (2012), “Invoicing Currency, Firm Size, and Hedging”, CEPII Working Paper 2012-28.